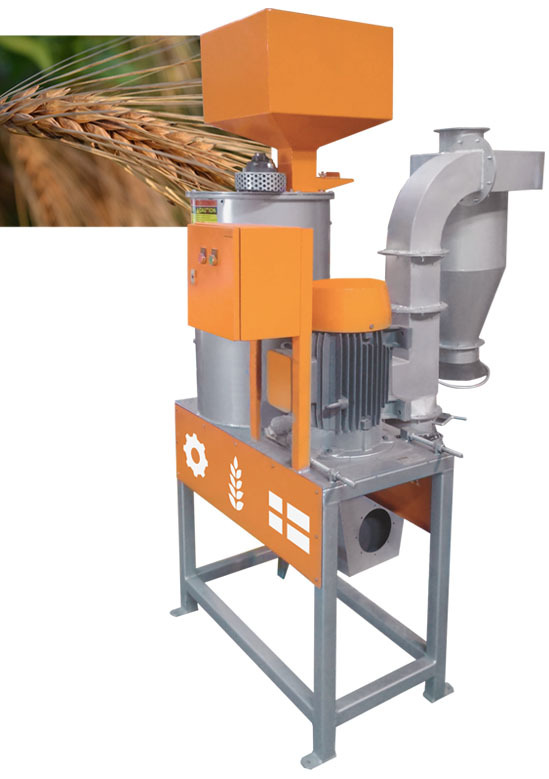 Barley polished by an ABC Hansen polisher allows for higher grade flour and for processing of pearled barley which is consumed in many markets as a staple food. When used in conjunction with one of the ABC Hansen stone mills or Universal mill or even Hippo hammer mill, the flour quality improves dramatically. It also improves the fermentability of the barley due to a higher concentration of carbohydrates in the "beer" mix. The use of an ABC Hansen polisher prior to stone milling, would allow for a lighter flour and would bake with a cream colour. The flour so obtained is the only flour able to be classed as “stone ground flour” as all other flours have extensive contact with steel. The polisher works on an abrasion principle with five stones of special emery and flint, which scours the bran from the barley kernel. The next stage of milling on a stone mill then provides for true "stone ground flour." In combination with organic barley, this is a highly desirable product in the health market.